Just seven weeks before the Oct. 1 launch of Colorados health exchange, managers said that their IT systems are not getting accurate data from state Medicaid systems, prompting a warning to board members Monday. Adele Work, the project manager who leads technology for Connect for Health Colorado, shifted her readiness estimate for synching with state systems from yellow, meaning cautiously moving forward,to red, meaning not ready. She highlighted her concerns Monday that state IT systems may not properly communicate with the exchange systems by Oct. 1. Work said shes prepared to shift to contingency plans on Sept. 15 if necessary. At that point, the exchange would freeze and deploy, meaning halt the planned system and deploy an emergency Band-aid fix. While exchange managers are meeting daily with state IT experts, Colorado designed its exchange as an independent public agency outside state government. That means exchange managers are dependent on state IT systems for their success, but they cant control them. A dashboard shows how outside forces are affecting exchange readiness. Interoperability problems have shifted from yellow to red and the arrow shows them staying at the red level. Time is running out since the exchange must go live on Oct. 1. We would have liked to have had everything coded and ready to go by the end of July. We ran into a couple of challenges (with Medicaid eligibility estimates)and are concerned about the accuracy, Work told members of the exchange board Monday. The schedule, as always and ever more, is incredibly tight, Work said. This is a huge project that were undertaking and its not just one system. Its multiple systems. Now time is running out. 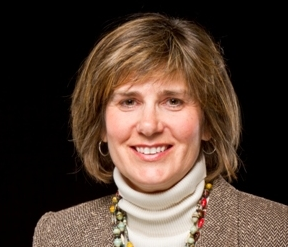 Sue Birch, executive director for the states Medicaid office, the Colorado Department of Health Care Policy and Financing, downplayed concerns about state readiness. We have this as a yellow issue on our side of the houseWere more confident than red, Birch told exchange board members. We go between green (meaning ready to go) and yellow, and were confident that well have our portion of PEAK (the system for applying for Medicaid benefits) done by Oct. 1. Gov. John Hickenlooper is Colorados third governor to deal with extensive problems related to states computer systems that are supposed to provide health care, welfare benefits and food stamps to the poor. The notoriously problematic Colorado Benefits Management System (CBMS) has cost the state hundreds of millions of dollars since 2004, and Hickenlooper brought in a new chief technology officer to try to fix the problems once and for all. Sue Birch, head of the states Medicaid department, says from her point of view, readiness is at a yellow level. She vowed that the state will be ready and systems will work by Oct. 1 when the exchange must open. The governor also installed his deputy chief of staff, Kevin Patterson, on the exchange board to try to ensure that Colorado succeeds in building its own health care marketplace, a central component of health care reform. Patterson joined Birch in promising that the state will be ready by Oct. 1. Like weve said to the JBC (Joint Budget Committee), when youre trying to a make something work better than it started, you dont click go and its done. It takes constant care and feeding of a system thats this large, Patterson said. The exchange IT systems are extremely complex and must communicate with multiple outside systems including the federal data services hub, which is supposed to provide real-time IRS data and proof of citizenship. Work said the federal hub has been on and off during testing so far. But the biggest problem may be that testing with the state is delayed. On an implementation checklist,Work showed nearly all other IT components in testing or completed. Under interface testing with Colorados Office of Information Technology and HCPF, the status simply says TBD and delayed. 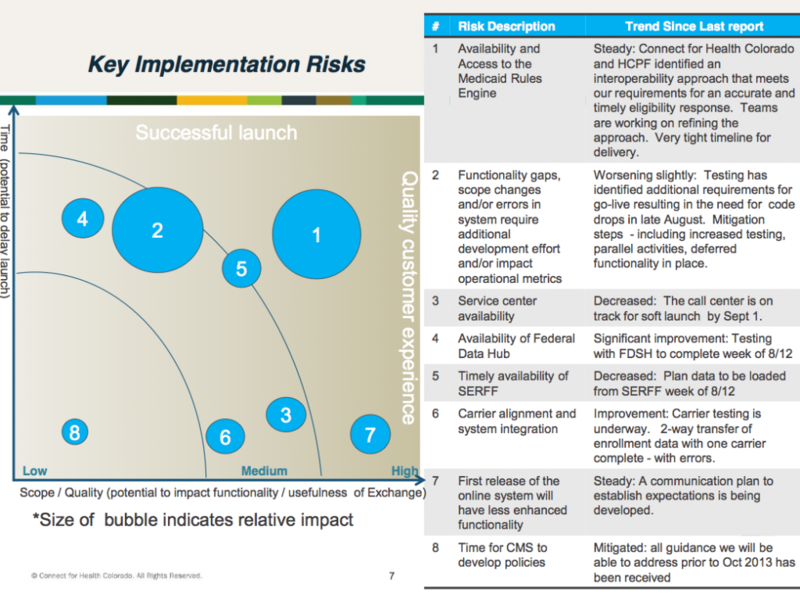 In a separate technology update,along with shifting the status of the Medicaid system integration from yellow to red, Work created a bubble chart showing risks to a successful launch. The biggest bubbles signifying the greatest risks centered on problems with Medicaid eligibility systems and overall functionality gaps and system errors. Some board members expressed concern, especially about the interoperability with state systems. Everything weve done has been tracking better. This is the one thing that has been tracking worse. When do we expect to start the testing? asked Nathan Wilkes, a computer expert and consumer advocate who runs his own firm, Headstorms Inc.
Work responded that testing with state systems is expected to start on Aug. 26. Originally it was supposed to have been completed by that date. Now the target date to complete testing is Sept. 15, Work said, just two weeks before the planned launch. That gave Wilkes and other board members pause. We havent even had the chance to find the defects in the system. Weve been at this for over two years now. Were literally in the 11thhour. From a technology perspective, we havent even touched it yet. Exchange board member and IT expert, Nathan Wilkes. My concern is that all of our shoppers are going to come and when the system says, Do you want to see if youre eligible to save money? (and they get routed to state Medicaid systems) there could be a bottleneck, Wilkes said. We havent even had the chance to find the defects in the system. Weve been at this for over two years now. Were literally in the 11th hour. From a technology perspective, we havent even touched it yet, Wilkes said. Work concurred that time is very short and that exchange managers have steep hills to climb. While she made it clear that she cant control HCPF managers, she plans to have her ducks in a row. We have seven weeks and a day. Weve moved from design and development to testing and implementation, she said. As we move forward, were going to hit challenges. I feel confident that this team has the ability to make decisions quickly. Ben Davis, a consultant who handles communications for the exchange, said managers are determined to build an interoperable system between the state and the exchange. We need to be open on Oct. 1 and the system needs to work, Miller said. Were identifying these problems now. Thats better than Oct. 5. © 2019 Health Policy Solutions. All rights reserved.